Will India and Pakistan Learn from the Historic Korea Summit? Despite being on the brink of all-out war a few months ago, leaders of North and South Korea agreed to keep the process of cultural and political exchange open. Kim Jong-un became the first North Korean leader to set foot in South Korea when he crossed the Military Demarcation Line, which separates the two Koreas, to meet South Korean President Moon Jae-in at the Peace House on April 27. The Peace House, a three-storey building constructed in 1989 in the truce village of Panmunjom on the South Korean side of the heavily-fortified demilitarised zone, has held over 300 rounds of inter-Korea talks in the last three decades. Two countries have been at war with each other since the 1950-53 Korean War, which ended with an armistice and without a peace treaty. This is the third occasion since the division of the Korean peninsula and first in the last 11 years that the top leaders of the two countries have met. Former North Korean leader and Kim Jon-un’s father Kim Jong-il had held two such meetings with then South Korean Presidents Kim Dae-jung and Roh Moo-hyun in 2000 and 2007 respectively. As the world watches keenly and local media on either side of the border rush to provide minute details – ranging from shapes of the tables and chairs to the dessert and noodles to be served at the venue – both expectations and cynicism levels are high. But before going into details of the topics said to be on top of the agenda, let’s look at some of the key terms and phrases often used when talking of bilateral ties. ‘Reunification’ of the Korean peninsula, ‘denuclearisation’ of North Korea and ‘family reunions’ of the people separated in the Korean War top the list. The reunification of the Korean peninsula remains a larger agenda, but denuclearisation is expected to be the most important topic of discussion in wake of the recent missile and nuclear tests by North Korea. Though Pyongyang announced on April 20 that it will temporarily halt its nuclear proliferation programmes, as it has several times in the past, complete denuclearisation of the peninsula remains elusive, despite ever intensifying global pressure on the North. Expectations are also high regarding a possible breakthrough in formally ending the 65-year war and efforts for lasting peace. Discussions over restarting the family reunion process are likely to be another important topic for the meeting, as the issue of separated families has been a matter of debate between the two Koreas for the last 60+ years. Initially, the talk was about the people allegedly kidnapped by the North during the Korean War, but later, the reference became families separated after the division of the peninsula. 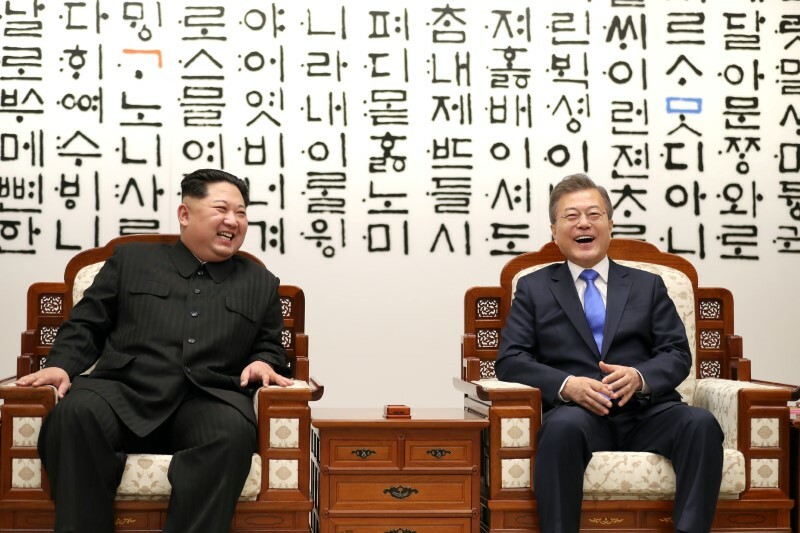 Both countries have held multiple rounds of reunions after they first started the process led by the South Korean government in August 2000, but this has been suspended since October 2015. North Korea’s Mount Kumgang region, a popular tourist site developed by South Korean automobile giant Hyundai, is also likely to be part of the bilateral discussion. Tours to the destination remain suspended since July 2008, when a South Korean tourist was shot dead by a North Korean soldier. The efforts made by both countries for the meet is commendable, given that the peninsula was on the brink of war just four months ago. The Koreas have reached this historic juncture following the North’s decision to send athletes, artists and a high-level delegation to the Winter Olympics 2018, held between February 9 and 25 in South Korea’s Pyeongchang. This was followed by a Korean musical group visiting Pyongyang early this month. Kim was the first North Korean leader to attend a performance by artists from the South. And now, the April 27 summit is being seen as groundwork for a proposed North Korea-US summit, probably in June. The gradual process of mending ties through sports, cultural exchanges and the historic meet presents a lesson for several sparring countries across the world. This is particularly true for India and Pakistan, as the South Asian neighbours were also partitioned from one region and share a historical, socio-cultural and linguistic inheritance, as the two Koreas do. So the question remains of whether India and Pakistan be rid of their adamant attitudes and restart the athletic and cultural exchanges that have been on pause for years. This is a lesson they could take from the historic meeting in the Korean peninsula, which has witnessed much more violence and bloodshed than the Indian subcontinent in the last six decades. Over 12 lakh people are estimated to have been killed in the Korean War, as compared to over a lakh in the Kashmir conflict, the main bone of contention between India and Pakistan. There have been concerns from several quarters that the two countries ignored a few key issues, as the meeting was expected to be focused on “denuclearisation, peace building and fence-mending between the Koreas”. According to a report published by South Korean daily Munhwa Ilbo, representatives from 40 rights groups on April 18 urged Seoul to raise the alleged human rights abuses in North Korea at the meeting. Political prisoner camps, crackdown on defectors and the alleged abduction of Japanese nationals were some of the issues they wanted raised. Meanwhile, South Korea’s main opposition, Liberty Korea Party, has urged the president to demand an apology from Pyongyang for its previous “acts of provocation and attacks”. “The South Korean government should also urge the North to apologise if it wants to regain public trust and successfully complete the summit,” the party said in a statement. The abduction of Japanese nationals in the 1970s and 80s remains the biggest issue for Tokyo, and it wants the US and South Korea to pressurise North Korea on this. At least 17 Japanese nationals, as officially recognised by Tokyo, were allegedly abducted by North Korean spies from Japan’s coastal areas in the 1970s, to teach Japanese language and culture, and to use their identities for espionage. Family members of the abductees say they have been betrayed several times as the issue was pushed aside for more important matters such as denuclearisation, Japanese daily Sankei Shimbun reported on April 22. On the other hand, China is also said to be unhappy over the summit as North Korea is not pushing forward its old demand of US troops’ withdrawal from South Korea. Meanwhile, some experts had voiced scepticism that even the key issue – denuclearisation – may not get adequately addressed as North Korea has merely decided to “suspend further tests” and has not “shown willingness for denuclearisation”. However, reports say that Kim and Moon have agreed to sign a declaration agreeing to a “complete denuclearisation” of the region. The declaration includes promises to pursue military arms reduction, cease “hostile acts,” turn their fortified border into a “peace zone” and seek multilateral talks with other countries, such as the US. Despite the doubts raised, the fact the Kim and Moon came together and made an effort to cease hostilities is no small thing. Going forward, the Koreas may be a good example for the South Asian neighbours to look to. R. Akhil is a Delhi-based journalist and a keen watcher of socio-political developments in the Asia-Pacific region.